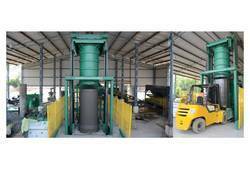 We are one of the leading manufacturer and supplier of Autmatic Concrete Pipe Machine. 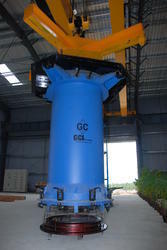 We are engaged in offering wide range of RCC Concrete Pipe Machinery. These are fabricated from finest quality raw material. These are very durable and features highly compact functions and robust designs. These can also customized as per the requirement of client and offer them at market leading prices. The BM-Roller Suspension Concrete Pipe Machine is a manually operated production system for the manufacture of concrete pipes. Heavy 100mm shaft with 30" runners (M.S. Runner or C.I.). Heavy pedestals and foundation joist of 12" x 16" square section is used. This type of Runner Machine is also available in option of Two, Three and Four Seater. We have gained recognition as an eminent enterprise, devotedly engaged in manufacturing a broad range of Cement Concrete Pipe Machine. In order to conquer enormous level of patron belief, we have been engrossed in offering a vast collection of RCC Pipe Making Machine. R.c.c pipe machinery used for making r.c.c pipes from 300 m.m diameter to 1200 m.m diameter complete with rail wheels , heavy duty pedestal, bearings , girder frame & gearbox etc. - The world’s most productive concrete pipe machine, capable of producing more than 100 pipes/hour in the smaller dimension ranges and capable of single-handedly serving the world’s largest markets. - The CAP 150/200/250 is most versatile, Indian manufactured, Vibrated casting technology Machine for producing Concrete Pipes, Manhole systems, Box culverts, Lined Pipes, Jacking Pipes etc. - The machinery is being manufactured under technical Know-How and JV with HawkeyePedershaab, USA. Our experts are assisting us in designing an extended range of RCC Spun Pipe Machinery that is extensively used in the global markets. Our technical experts are using the latest technology and extremely good quality material during the fabrication process in order to ensure the durability and dependability of these machines. FRP rings are dies made of Fiber Reinforced Plastics and are used to form the spigot in the pipe. Spigot is also known as the male component of the pipe. These come in set of two, from which one is used for the inner part of the pipe and the other is used for maintaining the tolerance and shape of the spigot on the outer side.